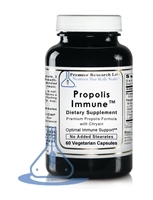 European, pesticide-free Propolis; time-proven immune, kidney, thymus and skin support* Propolis is used by the bee hive as the lining and sealant to the hive. Granting the hive powerful immune and anti-microbrial properties. Seal up our field and protect from pathogens.